We design and build our own ESP systems, since exceptional performance relies on attention to detail. Whatever your lifting challenge, Alkhorayef has a system available, or our specialists can engineer a solution that fits the bill. The depth of our portfolio meets any – and every – ESP requirement. We offer the full set of casing sizes, and accommodate the broadest range of flow rates and pump dimensions. Our multi-stage centrifugal pumps are available in either radial or mixed flow configuration. Proven to lift oil, water or brine while minimizing downtime, they include enhancement options for corrosive, abrasive and high load applications. Deliver long periods of stable production by expelling free gas to the annulus, or pressurizing and homogenizing multiphase fluids before reaching the ESP. Our vortex separators and process units are engineered to perform effectively in abrasive and corrosive conditions. Our three-phase AC, two-pole, squirrel cage, induction motors are all individually hand-wound, and feature superior insulation, lubrication and heat dissipation as standard. They are available in a range of diameters with multiple horsepower, voltage and current nameplate options and rated up to 325°F (163°C). Patented SPECTRUM ESP protector (seal) technology is engineered to maximize system run life; sealing against ultra-light well fluids and in extreme deviations. Additional performance enhancing options handle high horsepower, high head applications, and corrosive settings. Respond to dynamic well conditions and fine-tune your ESP to ensure the pump operates at the best efficiency to maximum ESP run life and recovery from the reservoir. Our downhole monitoring systems provides fast, reliable data on reservoir and pump performance. Our high reliability ESP power cables are available in both circular and flat designs in a range of sizes. The engineering team can also advise you on the best cable configuration for your application, including HPHT and extended reach wells. Modulate pump speed to extend the operating range of your ESP, and adapt to changing requirements. Our VSD systems also safeguard downhole equipment by providing electrical and mechanical soft-start features, electrical isolation and cleaner power output. 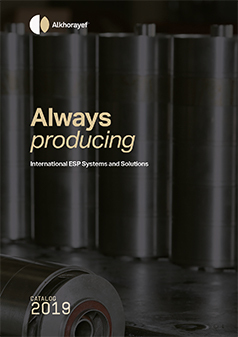 Every day our tailor-made SPECTRUM ADVANCE ESP solutions are at work in the toughest production environments on the planet, including sour gas, deep, ultra-slim wells and high viscosity hydrocarbons. Through our SPECTRUM ADVANCE tailored engineering services, Alkhorayef responds to clients’ unique application requirements, developing innovative engineered solutions that address more advanced challenges. Expertly configured for harsh conditions, SPECTRUM ADVANCE solutions overcome these challenges to extract the greatest value throughout each well’s life. Repeated ESP electrical failures in sour gas wells solved and leads to solution rollout to 50 wells.